The IBM InfoPrint 1812 is a monochrome laser printer that is capable of producing up to 40 ppm using letter-sized paper and a maximum of 38 ppm for A4 media. It comes fitted with a 50 sheet multi-purpose feeder that is much more convenient than the single sheet systems found on older models and makes it more suited to modern businesses. This printer is a cost-effective choice for personal or business users who want to upgrade an older or more expensive printer. It includes a number of advanced features that would often only be found on higher cost models, providing users with excellent value for money. This printer is a compact model and the enclosed paper drawers enable a large paper capacity, even with a small footprint. The IBM InfoPrint 1812 comes with a 250-sheet drawer as standard, but there is the option of adding a 550-sheet drawer to give an overall capacity of 850 sheets. 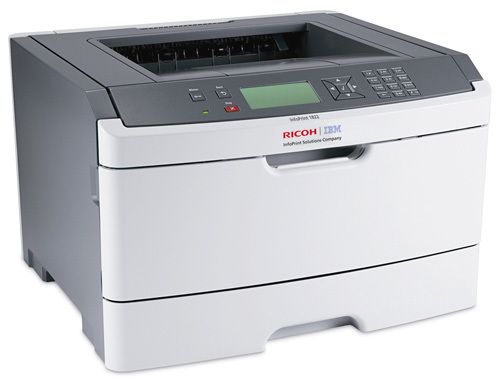 This is an extremely quiet printer, which reduces noise levels within an office. The risk of paper jams and curling is reduced by the single-sheet rear exit, to limit the amount of wastage and improve productivity. The energy efficient sleep function on the IBM InfoPrint 1812 provides a quick start feature that enables the first page to be printed in around 6.5 seconds. The InfoPrint 1812 has a fast 400MHz processer that allows it to quickly process even complex print jobs to improve workplace productivity. The use of the multi-purpose feeder enables a wide variety of media to be used, including envelopes, labels, transparencies and card. The IBM InfoPrint 1812 does not have the capacity to print in colour and there are no additional features, such as copying or scanning. This model is not suited to larger offices, where high capacity printing is required regularly.